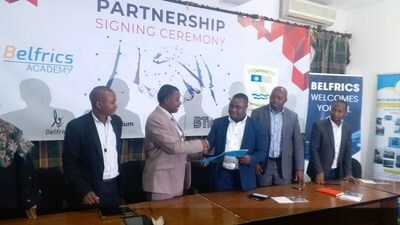 DAR ES SALAAM, Tanzania, April 15, 2019 /PRNewswire/ — Belfrics Group, one of the largest international blockchain conglomerates of the world, in association with Dar Es Salaam Institute of Technology (DIT), one of the leading technology and engineering institutes in Tanzania and the East African region, today announced a joint initiative to develop a pool of talented and skilled technology professionals for blockchain as a domain. Belfrics Academy SDN BHD, the research, international training and skill development vertical of Belfrics Group of Companies, would lead the efforts to address the knowledge-gap and the rapidly growing requirements Blockchain Talents in the industry. “We are pleased to see educational leaders like DIT come forward and being open to the need of the industry. I would say, that this is the right time, between being proactive or before being reactive to the industry demands. Employment and development is Key, and for that we must understand where the future is. DIT is doing just that. In fact, we’re pleasantly surprised to see the level of awareness and requests from other prestigious institutes from the East African Region for blockchain skill development. Since we are one of the major blockchain talent hirers ourselves, we are very much aware of the quality and quantity of the talent available currently. Such collaborations are required to address the current gap,”says E C Uday Senan, Global Strategist — Belfrics Academy. “ Blockchain technology is among the emerging technologies that will soon revolutionize the internet and the ICT industry. Due to its inherent features, such as distributed system with no single point of failure, usage of cryptograph for data protection, and fast data transfer and sharing of digital assets, Blockchain has huge potential and a number of applications, particularly in developing countries. To leverage the potentials of this technology, it is critically important we create awareness of the technology as well as build the capacity of our students, staff and the general public. This is exact what DIT will do in collaboration with Belfrics. This will enable DIT to become the hub of blockchain technology, the hub where capacity building of our people as well as experimentation and eventually development of the blockchain systems for improving government service delivery will take place,” says Dr Joseph W. Matiko, the Director of ICT Centre at Dar es Salaam Institute of Technology. Contestants Ride Donkey Carts to IEBC.